So many times during peer revising my students just read their partners work and say, "It's great!" or change one or two things. But do they really know what they are looking for? 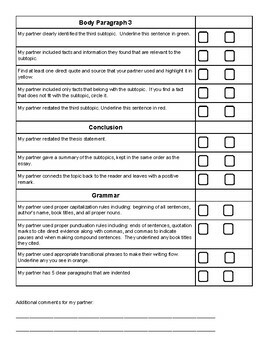 With this checklist, students not only have to read the essay and make comments, but they have to prove that their partner included all the necessary content by color coding each part! Students go through each section and pick out each element. If they don't find anything to color code, then they know their partner needs to go back and add that into their writing. This checklist is designed specifically for research based essays, but I have similar checklists for other types of writing in my store.